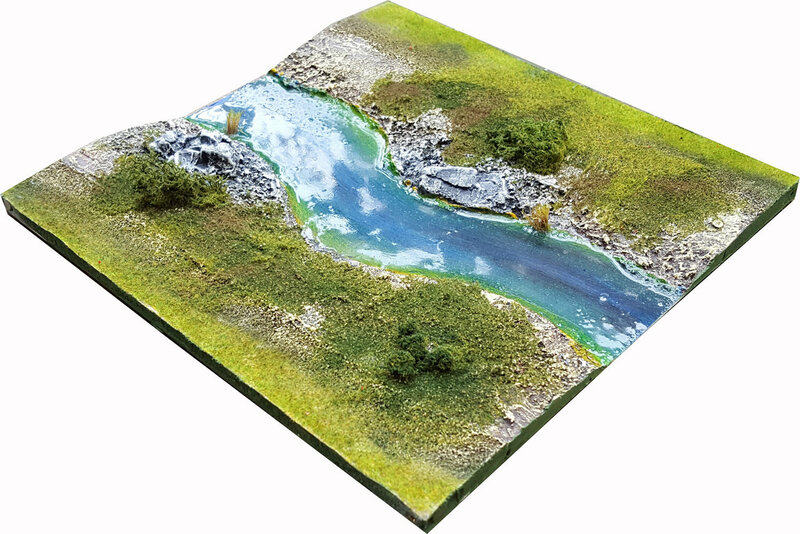 Expand your terrain set with extra River tiles. The River tiles are available either in 6 regular designs (straight and turns), a River Ford tile (including parts of a road) or a Widening River Turn tile (which can be upgraded to a partial marshland). They may have three finishes: painted, liquid glass or floating ice blocks (which included liquid glass). The flow may represent: water, lava, green toxic waste, or a dry river bed. The Tile is available in all available Themes. What really makes the difference though, is that you can at anytime convert these tiles into marshland. With the corresponding add-on, you can clip on and off swamp surface, creating a partial marshland on a river side. The partial marshland addon also includes a magnetic Willow tree.